"An island in the sun where restless souls may find each other." - LIFE Magazine. "The island is fabulously hedonistic, but Europe’s favourite party playground is also surprisingly traditional." - Christopher English. IBIZA is an island in the Mediterranean Sea, 79 kilometres (49 miles) off the coast of the city of Valencia in eastern Spain. It is the third largest of the Balearic Islands, an autonomous community of Spain. Its largest cities are Ibiza Town, Santa Eulària des Riu, and San Antonio. Its highest point, called Sa Talaiassa (or Sa Talaia), is 475 metres (1,558 feet) above sea level. 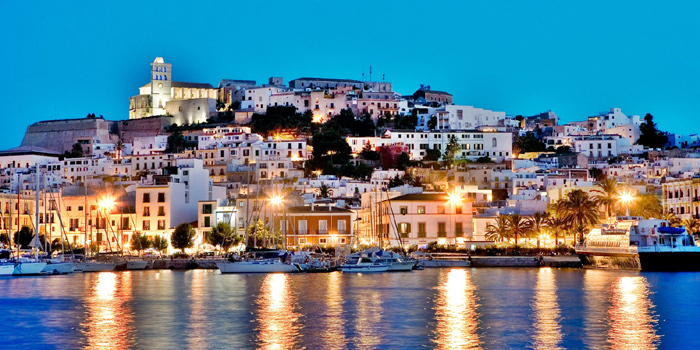 While it is six times smaller than nearby Majorca, Ibiza is over five times the size of Mykonos (Greece), or ten times the size of Manhattan Island. 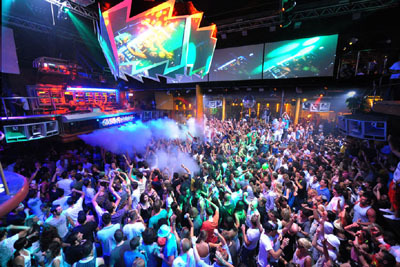 Ibiza has become famous for the association with nightlife and the electronic music that originated on the island. It is well known for its summer club scene which attracts very large numbers of tourists, though the island's government and the Spanish Tourist Office have controversially been working to promote more family-oriented tourism. 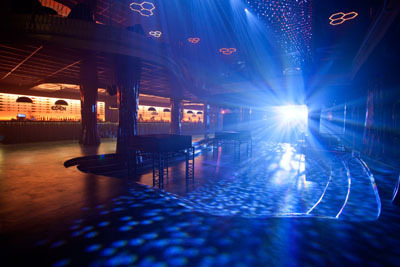 Noted clubs include Space, Privilege, Amnesia, Ushuaïa Ibiza Beach Hotel, Pacha, DC10, Eden, and Es Paradis. 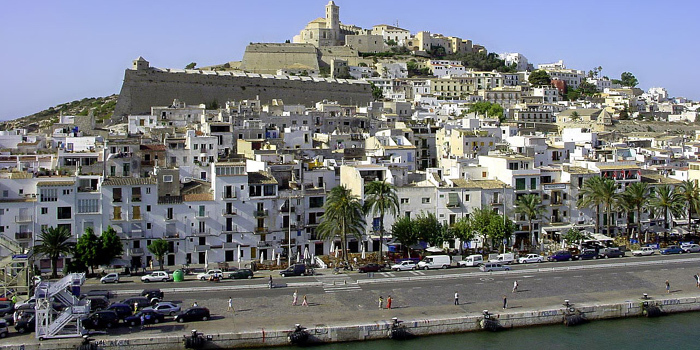 Ibiza is the home of the noted "port" in Ibiza Town, a popular stop for many tourists and now a UNESCO World Heritage Site. Ibiza is a haven for hippies and hedonists; a refuge for black sheep, misfits and mystics, draft-dodgers and Hollywood stars fleeing scandal. 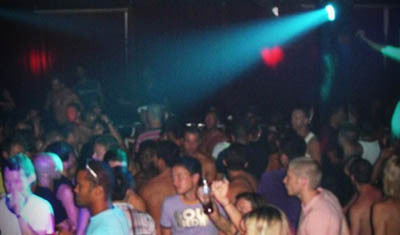 But the Balearic island's reputation as a bohemian party playground was earned long before the arrival of the escapists in the 1960s. Its name is derived from Bes, the Egyptian god of protection, music and dance, and the island's longstanding culture of tolerance and freedom has seduced everyone from the Carthaginians, Romans and Vandals to the Byzantines, Moors and pirates. 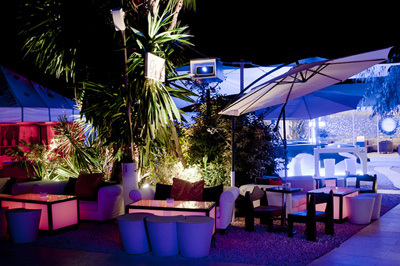 Blue Marlin Ibiza - open every day from the 1st of April until middle of October. Mediterranean cuisine fusion with Asian influence, Sushi and the top cocktails of the island. Playa de Cala Jondal, Cala Jondal Bay, 07840 Ibiza. 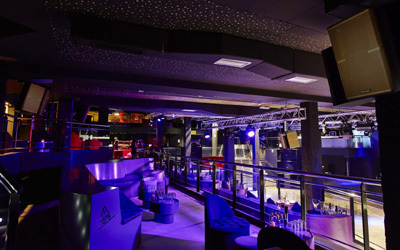 Cavalli Club Ibiza - Paseo Maritimo Juan Carlos 1, 13, 07800 Ibiza. Situated in the most exclusive area of the Mediterranean island, the new Cavalli experience presents his entertainment & nightlife concept in the heart of the promenade that welcomes yachts into the harbour of Ibiza Marina. 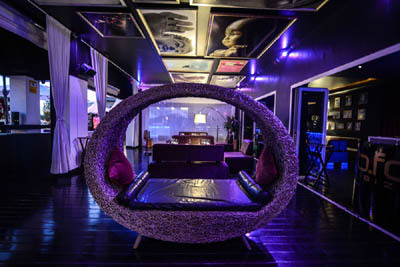 The LOUNGE embody the glamorous soul of the designer, hosting exclusive and fashionable parties and events where guests can sip on Roberto Cavalli Vodka-based cocktails. Furthermore, a refined musical selection is ensured by the best artists in the business. 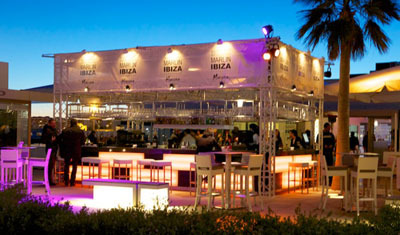 Cipriani Downtown Ibiza Lounge - Paseo Juan Carlos I, nr. 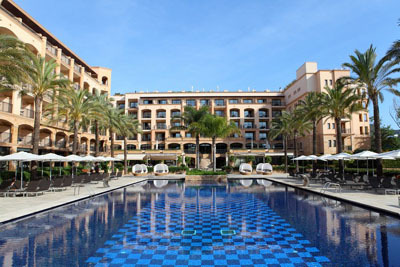 17, Ibiza Gran Hotel, 07800 Ibiza Town. Cotton Beach Club - Posta De Sol 21, Cala Tarida. 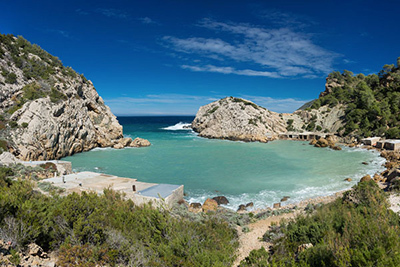 The all-new, luxurious Ibiza beach club set to impress in Cala Tarida, making the island’s southwest coast the destination du jour for islanders and jetsetters alike. Featuring jaw-dropping views across the Mediterranean, and a private sandy beach below clear of seaweed and rocks, the Cotton Beach Club offers changing cabins and private showers for beachgoers to be comfortable moving from lounge to lunch. The Cotton Beach Club serves lunch and à la carte dinner after beach hours where the kitchen surprises guests with a selection of food that is available before and during a spectacular sunset. 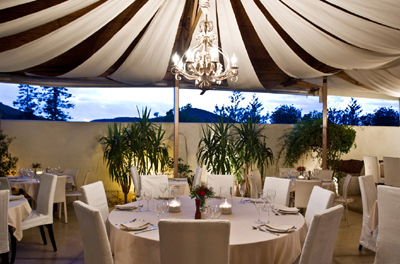 The venue is perfectly suited for exclusive private events from launches to weddings, celebrations and parties. 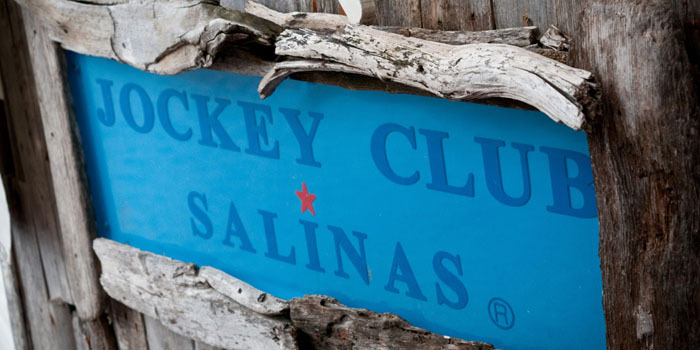 Jockey Club - "Since 1993 we have been a beach restaurant with the spirit of a chiringuito (outdoor bar)." Playa de Salinas, s/n, Parc Natural de ses Salines, 07818 Ibiza. 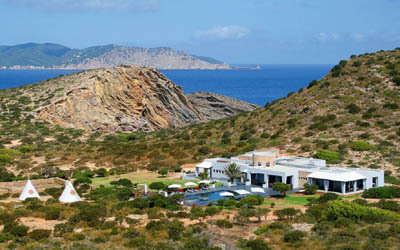 KM5 - Sant Josep Km 5,6, Sant Josep de Sa Talaia, 07830 Ibiza. Indoor lounge & lounge garden. 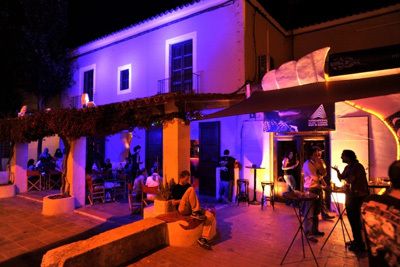 MATCH BAR - Calle Garijo 5, Puerto de Ibiza, 07800 Ibiza. Offers a little bit of London in the Balearic sunshine. 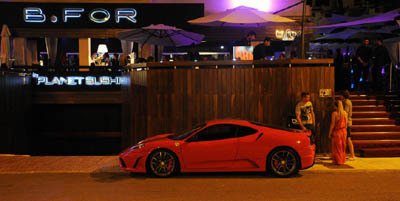 The terrace is a prime spot for people-watching, making it the perfect place for a pre-Pacha drink. 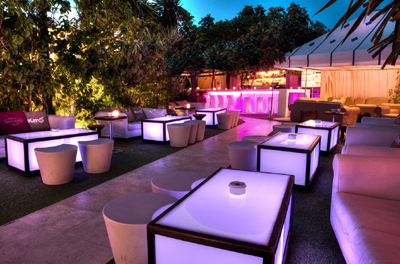 Nassau Beach Club Lounge - Playa d'en Bossa Bossa, s/n, Sant Josep de Sa Talaia, 07817 Ibiza. Orso - Avenida 8 de Agosto, Nº 29, 07800 Ibiza. 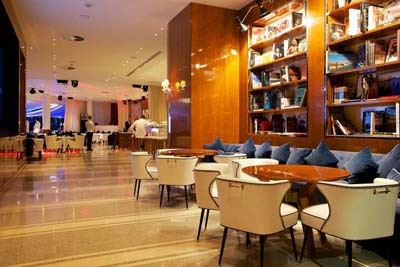 Restaurant & Lounge Bar. Live performances every night. The Tower at UshuaÏa Beach Hotel - "The Tower is all about exclusivity and style - and voyeurism! 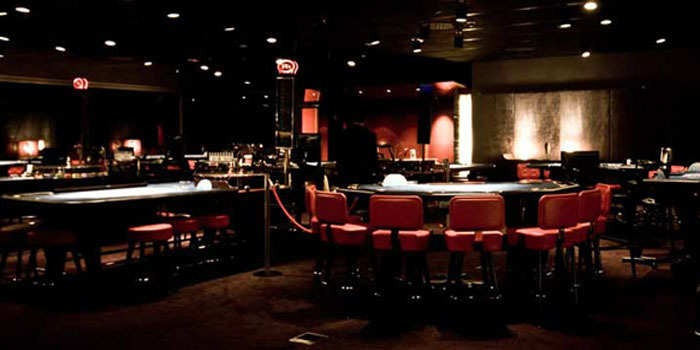 Enjoy the music from two different angles - watch the macro events front row with the rocking crowd at The Club or get an elite, bird´s eye view of the action from our roof top Mile-High Club." Playa d'en Bossa 10, Sant Jordi de Ses Salines, 07817 Ibiza. 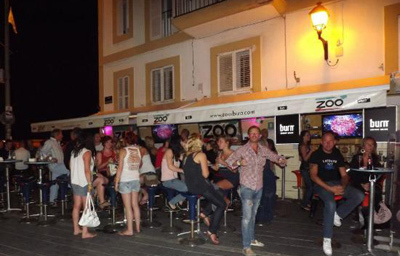 Zoo Bar - Plaza Antoni Riquer 6, Puerto de Ibiza, 07800 Ibiza. 10 of the best beaches in Ibiza - skyscanner. 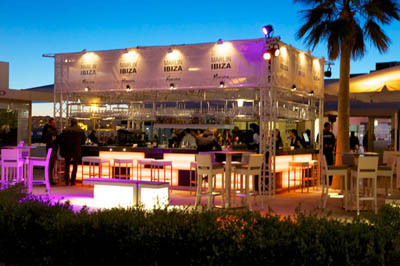 Ibiza Beach Clubs - Essential Ibiza. 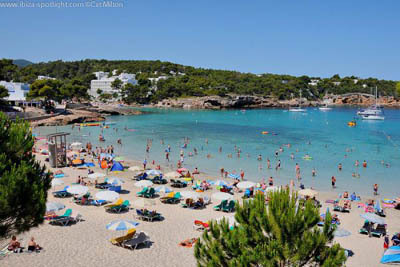 Ibiza's beautiful beaches - Ibiza Spotlight. Cala d'Hort Beach - 10 minutes drive from either San José or Cala Vadella. Sant Josep de sa Talaia, 07830 Ibiza. 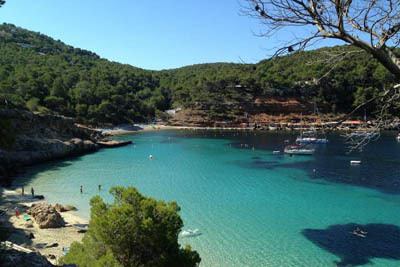 Cala Salada Beach - 15 minutes drive from San Antonio, 07820 Ibiza. 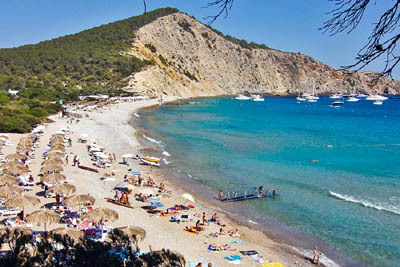 Es Portitxol Beach - widely regarded as Ibiza’s most secluded beach, in the north of Ibiza. 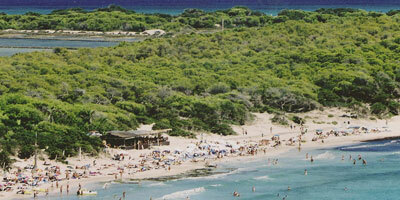 Las Salinas Beach - one of the most iconic of all Ibiza beaches. In between Es Cavallet and Cap d’es Falco. 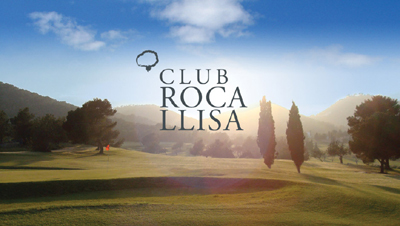 10 minutes drive from Playa d'en Bossa or Ibiza Town. 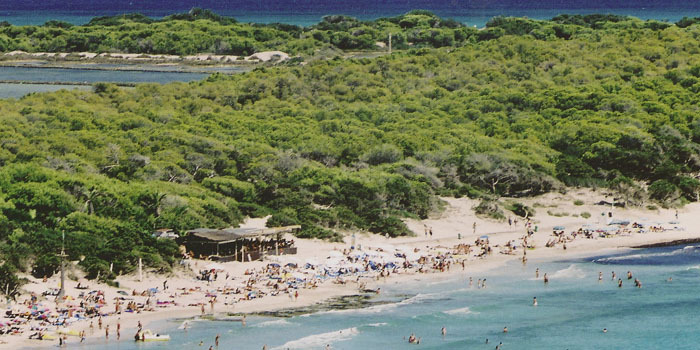 Playa d'en Bossa Beach - the longest stretch of beach on the island. Sant Josep de sa Talaia, 07830 Ibiza. Portinatx beaches - 3 beaches in the resort of Portinatx, 10 minutes drive from San Juan. Sant Joan de Labritja, 07810 Portinatx. 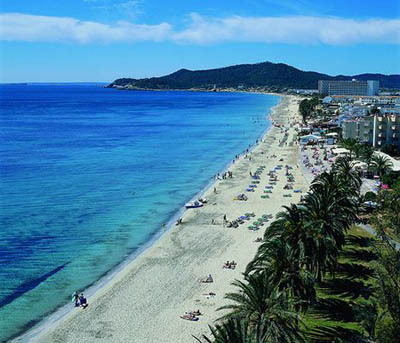 Talamanca beach - the closest beach in proximity to Ibiza Town. Aguas de Ibiza *****. Salvador Camacho 9, 07840 Santa Eulalia del Río. 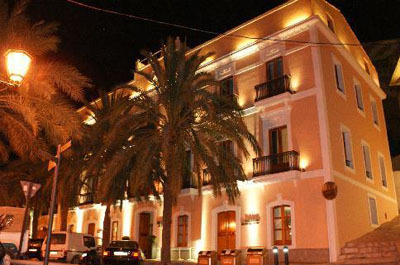 Boutique Hostal Salinas ****. Calle de Canal 2, 07817 Sant Jordi de Ses Salines. Tagomago Island - "The paradise of "Tagomago" is one of the few and most beautiful private islands in Spanish waters. Tagomago island is perfectly located and only 900 metres from the coast of the jet set island of Ibiza and only a 30 minute boat ride from the beautiful beaches of Formentera." Destino Ibiza ****. 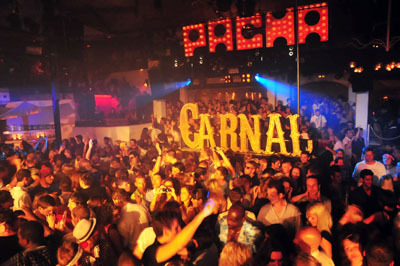 Pacha Ibiza Hotel & Resort. Avenida Cap Martinet, 07819 Santa Eulalia del Rio. 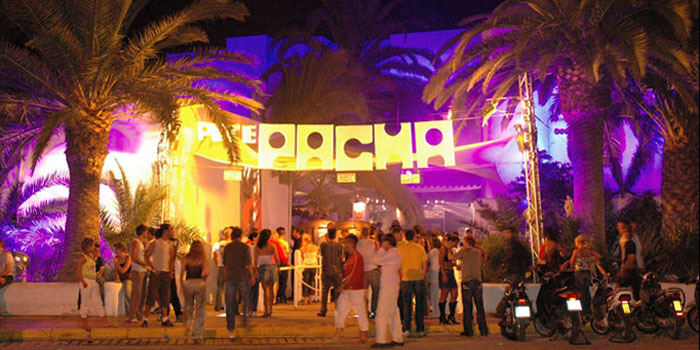 El Hotel de Pacha ****. In one of Ibiza town's smartest areas, El Hotel de Pacha enjoys fantastic views across the Marina towards the old town of Ibiza and is close to the chic boutiques and trendy bars of Marina Botafoch, and the world famous Pacha club itself. Calle Historiador Joan Marí Cardona 3, 07800 Ibiza. 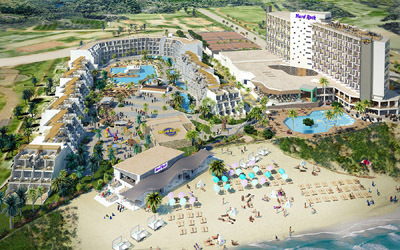 Grand Hotel Palladium Spa & Health Resort *****. Calle Los Lirios 1, Siesta, 07814 Santa Eulalia. 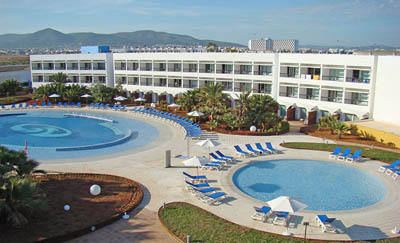 Grand Palladium Palace Ibiza Resort & Spa *****. Calle Playa d'en Bossa, s/n, 07817 Sant Jordi de Ses Salines. Hard Rock Hotel *****. Playa d'en Bossa, S/N, 07817 Sant Jordi. 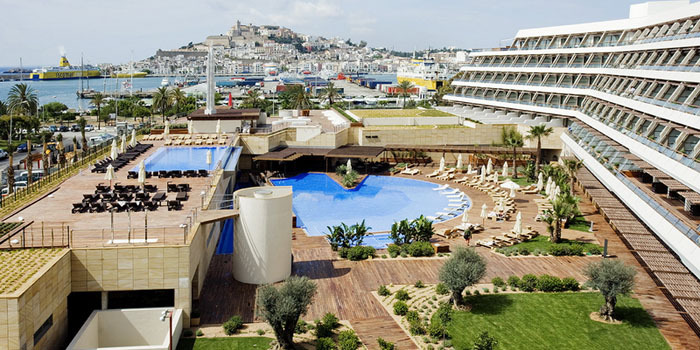 Ibiza's biggest five-star hotel. Hotel Hacienda Na Xamena *****. Urbanización Na Xamena, s/n, Buzón 11, 07815 San Miguel. 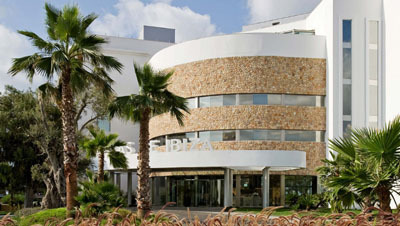 Ibiza Corso Hotel & Spa ****. Calle Illa Plana, s/n | Marina Botafoch, 07820 Ibiza Town. 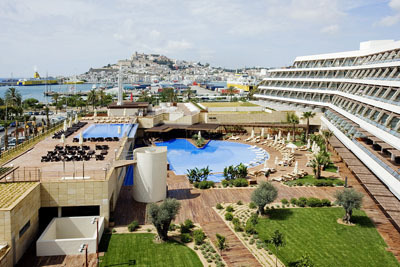 Ibiza Gran Hotel *****. "Contemporary Luxury Experience." Passeig de Joan Carles I, 17, 07800 Ibiza Town. 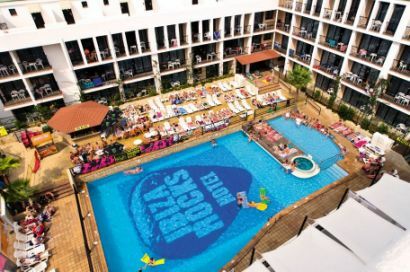 IBIZA ROCKS Hotel ***. 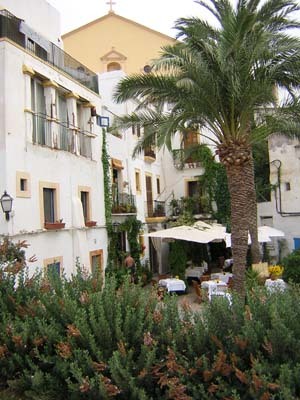 Carrer de Cervantes 27, San Antonio, 07820 Ibiza. Insotel Fenicia Prestige Suites & Spa *****. Calle Narcisos, s/n, Urbanización Siesta, 07840 Santa Eulalia del Río. Mirador de Dalt Vila ***** R&C. "An exclusive and unique deluxe hotel in Ibiza." Plaza de España, 4, (Dalt Vila) 07800 Ibiza Town. 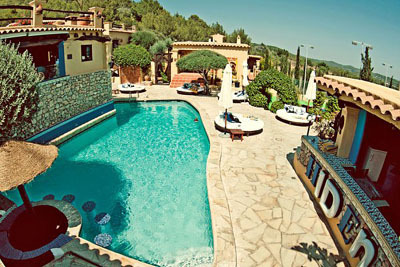 Pikes Hotel - **. Camí Sa Vorera, s/n, 07820 Ibiza. 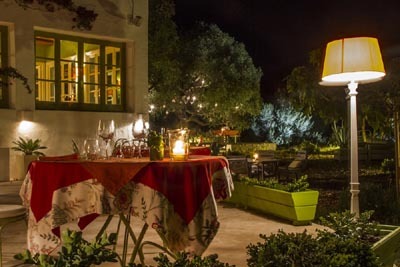 It is located in the countryside, 1.6 miles (2.6 km) to the northeast of the town of Sant Antoni de Portmany, and 10.2 miles (16.4 km) to the northwest of Ibiza Town. A 15th-century stone mansion which was a finca (farm estate), it was converted into a hotel in 1978 by British-born Australian Anthony Pike. 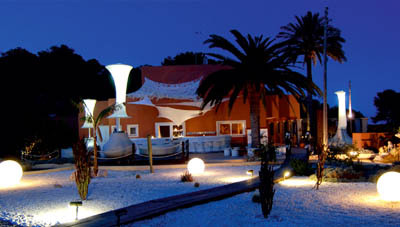 The hotel, cited as one of the most famous or infamous hotels on the island, developed a notorious reputation for hedonism in the 1980s, and is associated with being a playground for the rich and famous. It is best known for being the location of filming for Wham! 's 1983 hit Club Tropicana and for Freddie Mercury's 41st birthday bash in 1987, cited as one of the most lavish parties ever to be held on Ibiza. 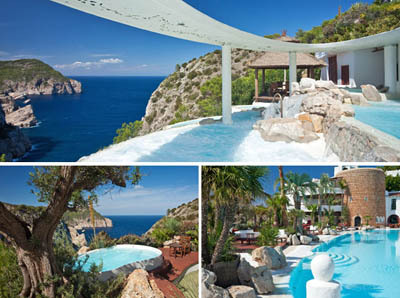 25-room boutique hotel immersed in rock ’n’ roll history and revamped by the revolutionary Ibiza Rocks brand. The multi-award winning haven features a stunning destination terrace restaurant, famous poolside bar and plenty of individually designed decadent rooms, bespoke suites and playful party spots. The Giri Residence ****. 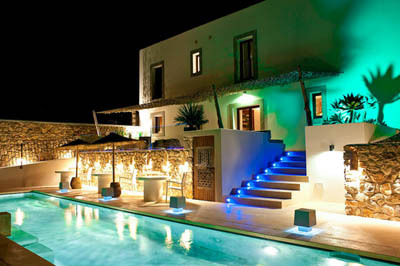 Winner "Best Design Hotel in the world" - 2011 Boutique Hotel Awards. Calle Principal 5, 07810 San Juan. 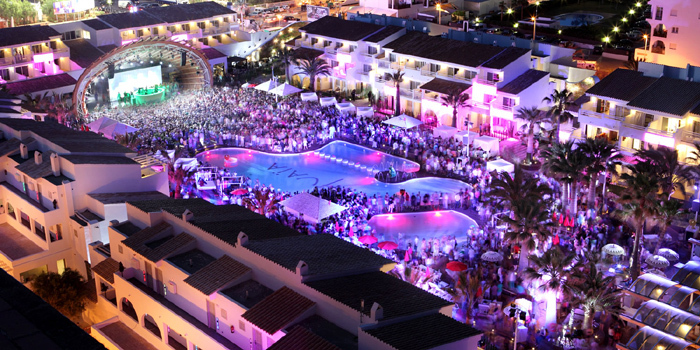 Ushuaïa Ibiza Beach Hotel & Tower *****. Playa d'en Bossa 10, 07817 Sant Jordi de Ses Salines. 36 Hours in Ibiza, Spain - The New York Times. Amazing IBIZA - "A Lifestyle Management company and our mission is to guide clients and visitors to the best Ibiza has to offer." AngloINFO Balearics - "Everything you need for life in Mallorca, Menorca & Ibiza - local information you can trust." DIARIO DE IBIZA - Ibiza's leading newspaper. 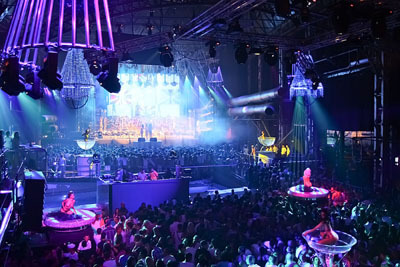 Essential IBIZA - clubbing news, VIP tables, Ibiza beaches. Farewell, monotonous house music: the Balearic beat is back to save Ibiza - The Guardian. golden mile of Ibiza Town - "At the entrance to the port of Marina Botafoch where the most exclusive shops are, opposite the ancient city of Dalt Vila, overlooking the island of Formentera." IBIZA 2013 - "News, Party Calendar & Guide." Ibiza Airport - IATA: IBZ, ICAO: LEIB. Carretera Aeropuerto, s/n, 07818 Sant Jordi de Ses Salines, Ibiza. 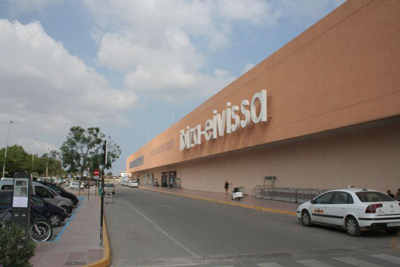 The airport is located 7 km (4.3 mi) southwest of Ibiza Town. Serving Ibiza and Formentera. The airport traffic is characterised by the seasonal nature of the tourist industry, and as such it handles over 85% of the total volume of passengers during the six months of the peak season (May–September). The airport also offers year-round scheduled inter-island and mainland traffic, with flights operating to primary business hubs, such as Barcelona, Madrid and Palma de Mallorca. 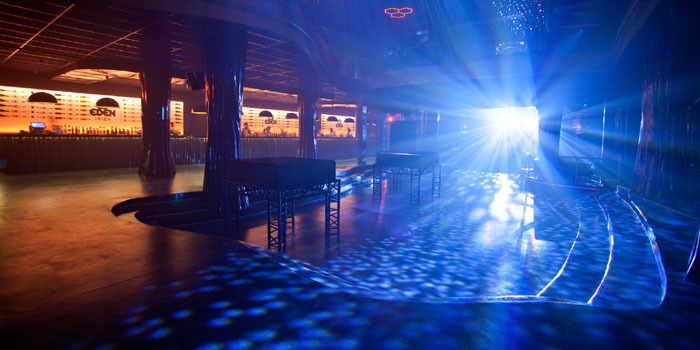 IBIZA Club News - Twitter. 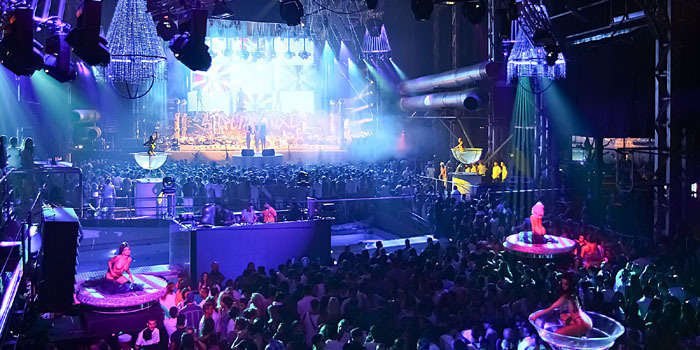 IBIZA Guide - Urban Junkies. "We’re huge fans of the white isle and have long been meaning to put together an indispensible insider’s guide – for both newcomers and old-timers. To make sure we got it right we teamed up with Serena Cook – founder and owner of renowned Ibiza concierge Deliciously Sorted – to bring you a carefully curated list of the best the island has to offer. On top of that, we asked our friends at Resident Advisor for their top clubnight picks." Ibiza icon Tony Pike dies aged 85 - "Hotelier epitomised hedonism of the island where he held raucous parties for celebrities." IBIZA Maps - "Ibiza Hotels, Beaches & Restaurants." IBIZA Now Magazine - since 1984. "The only English language magazine on Ibiza and as such serves the entire International community of the island." IBIZA Soup - "Your guide to all the best places to eat, chill and party in Ibiza." IBIZA Spotlight - "After 23 years of publishing printed island guides highlighting the very best that the island has to offer, Ibiza Spotlight launched online in 1999 and has since built an almost iconic reputation as a source of information and services for Ibiza." IBIZA Style - "The Internet Portal about Ibiza." 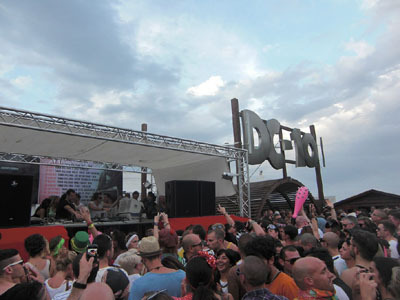 Resident Advisor - Ibiza summer clubbing. 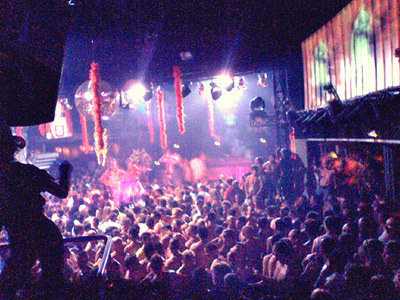 The Notting Hill of Ibiza - The Telegraph. 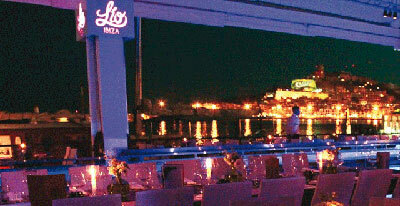 Welcome to Ibiza - the official Ibiza tourist information website. White Ibiza - since 2008. "If it’s cool, in demand and on the white isle, you’ll read about it on White Ibiza." 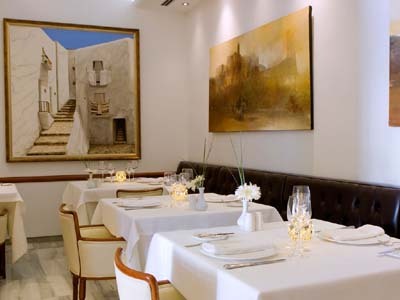 High-end travel guide: Ibiza’s very best restaurants, hotels and holiday experiences. 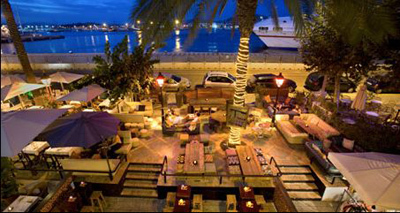 Marina Botafoch - situated on the North side of the Port of Ibiza. It was built with a Concession granted by the Ministers Board of the Spanish Government on May 23 rd , 1984. 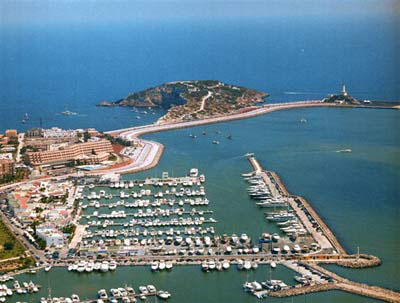 In full activity since 1987, this Marina has 428 berths from 6 up to 30 metres. 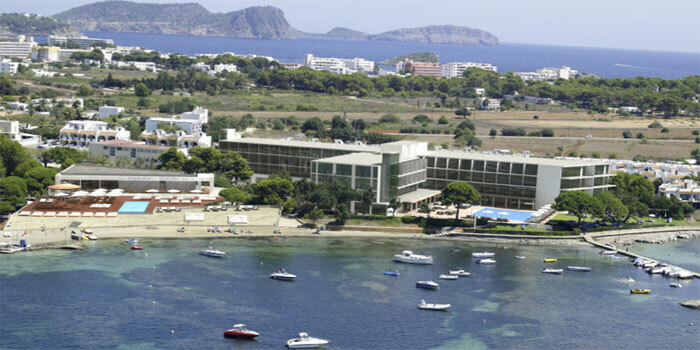 Marina Ibiza | Puerto Deportivo Marina Ibiza - Passeig de Joan Carles I, 20, 07800 Ibiza Town. 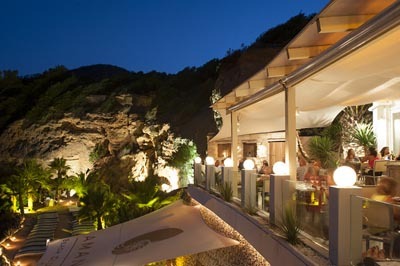 Blue Marlin Ibiza - Playa de Cala Jondal, Cala Jondal Bay, 07840 Ibiza. 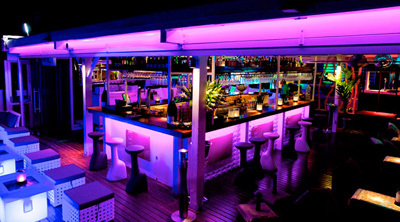 B.For Ibiza - Avenida 8 de Agosto, 07800 Ibiza Town. Japanese fusion food. 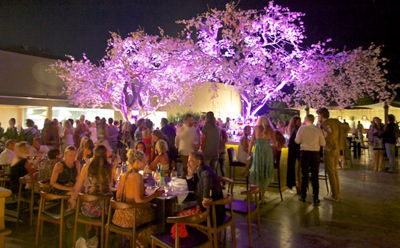 Blue Marlin Ibiza - open every day from the 1st of April until middle of October. 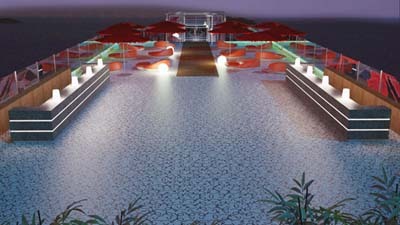 Mediterranean cuisine fusion with Asian influences, Sushi and the top cocktails of the island. Playa de Cala Jondal, Cala Jondal Bay, 07840 Ibiza. 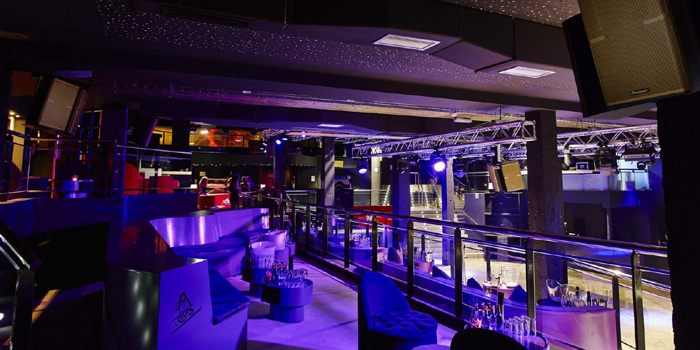 Cavalli Club Ibiza - Paseo Maritimo Juan Carlos 1, 13, 07800 Ibiza. Situated in the most exclusive area of the Mediterranean island, the new Cavalli experience presents his entertainment & nightlife concept in the heart of the promenade that welcomes yachts into the harbour of Ibiza Marina. 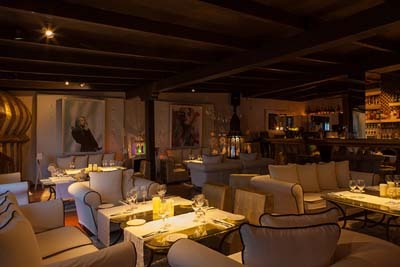 The new Cavalli Ibiza features an open-air RESTAURANT where luxury and innovation are merged in the décor and in the details to create a unique ambience, allowing the clients to live a ‘total experience’ in pure Cavalli style. In this context the clients will be able to enjoy the same welcoming reception that the designer would reserve for his friends. 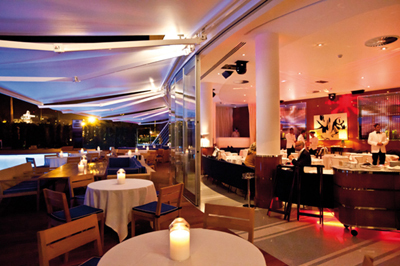 Cipriani Downtown Ibiza - Paseo Juan Carlos I, nr. 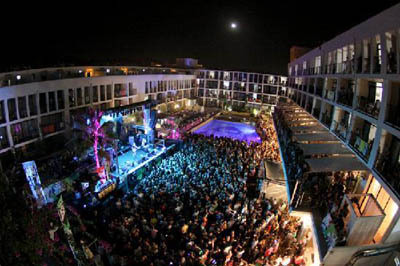 17, Ibiza Gran Hotel, 07800 Ibiza Town. 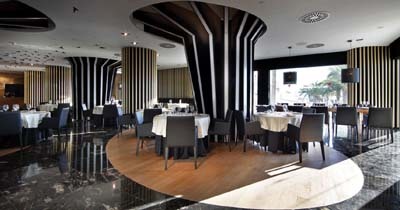 Es Mirador Restaurant R&C (Chef: José Ribas). At Hotel Mirador de Dalt Vila, Plaza de España 4, 07800 Ibiza Town. 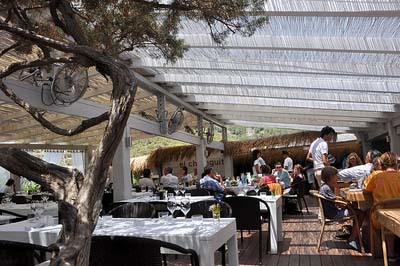 Jockey Club - "Since 1993 we have been a beach restaurant with the spirit of a chiringuito (outdoor bar). 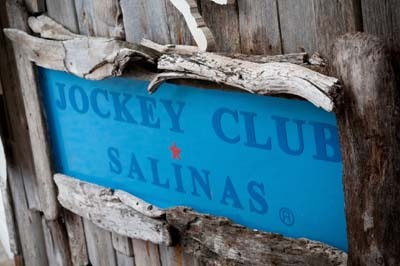 Jockey Club, Playa de Salinas, s/n, Parc Natural de ses Salines, 07818 Ibiza." 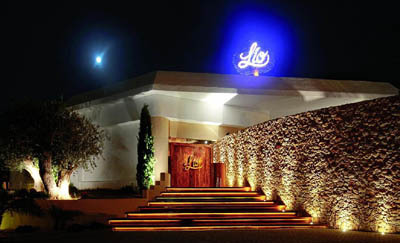 La Scala - Sa Carrossa 7, Dalt Vila, 07800 Ibiza Town. LÍO - Paseo Juan Carlos, Puerto Deportivo Marina Ibiza, 07800 Ibiza. Nuba - Chef: Billy Baroja. Paseo Juan Carlos 1, 13, 07800 Ibiza Town. 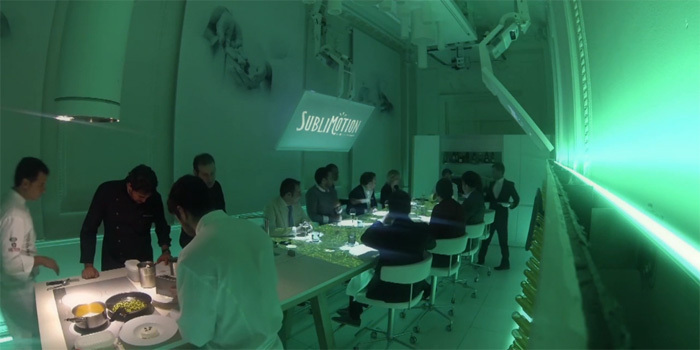 SubliMotion - chef: Paco Roncero - awarded with two Michelin Stars, three Repsol Suns and the 2006 National Gastronomy Award. Opens on May 18, 2014. Will seat 12 guests at a time for a 20-course gastro-sensory meal that will cost 1,500 per person, or more than US$2,000 a head. World's Most Expensive Restaurant. El Ayoun - Morrocan cuisine. Avenida Isidoro Macabich 6, 07800 San Rafael. 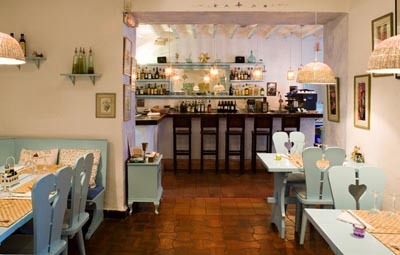 La Paloma - Mediterranean cuisine. Cami de Can llatzer, San Lorenzo, 07812 Sant Joan de Labritja. Sacca - (Chef: Lex Hauser). Asian fusion cuisine. Carretera San Juan, Km 13.5, 07812 San Joan de Labritja. 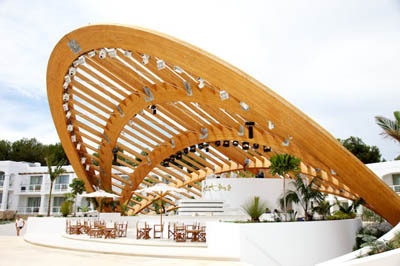 UshuaÏa Beach Hotel Restaruants - Minami (Japanese cuisine), The Beach Club & Montauk Steakhouse. Playa d'en Bossa 10, 07817 Sant Jordi de Ses Salines. Can Domingo - Italian cuisine. Carretera Ibiza-San José, Km 9.8, 07830 Sant Josep de sa Talaia. 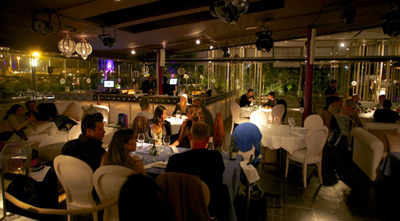 El Chiringuito - Mediterranean cuisine. Playa Es Cavallet, 07830 Sant Josep de sa Talaia. 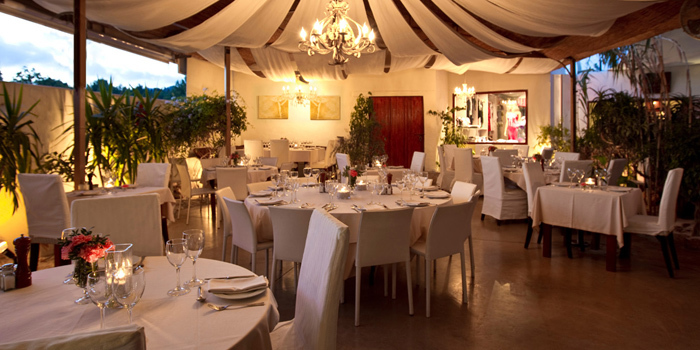 KM5 - "Our kitchen offers the best Argentinian beef or local fish, all cooked on the wood burning grill, fresh pasta, delicious desserts and service." Sant Josep Km 5.6, 07830 Sant Josep de sa Talaia. 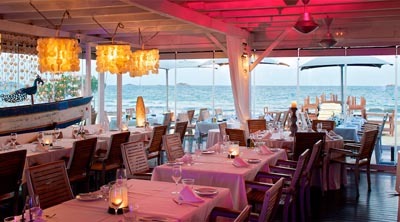 Nassau Beach Club Restaurant - molecular gastronomy. Carretera de la Playa d'en Bossa, 07830 Sant Josep de sa Talaia. Restaurante Coco Beach - Calle de la ciudad de Palma s/n, Playa d’en Bossa, 07817 San José. 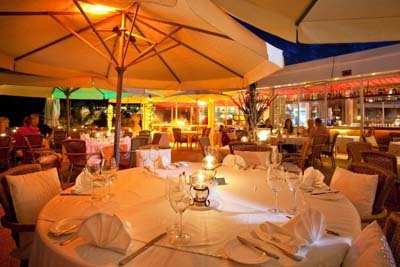 AMANTE BEACH CLUB - Italian influenced modern Mediterranean cuisine. Chef: Carlos Fernandez. Sol Den Serra, Calle Fuera, s/n, 07849 Santa Eulalia del Río. 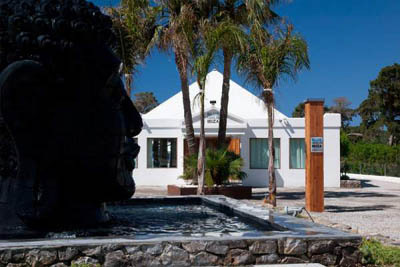 Bambuddha - Carretera de San Juan, Km 8.5, 07840 Santa Eulalia del Río.